Last Weekend was a real triple play out at Sleeping Bear Dunes National Lakeshore. I hiked out to the point of the dunes just to the west of Glen Haven in Leelanau County, Michigan. My original intent was to set up for a startrail shoot for the night. Everything was working so far: no wind, forecast for mostly clear skies, no forecast for precipitation, early enough in the season for limited presence of others, no moon and a long enough window of darkness for a useful shoot. The clouds were quite cooperative for a few sunset shots. I set up for HDR and pano setups shooting primarily with my 24-70 and Really Right Stuff pano setup on my tripod. I also used a Cokin split ND filter and holder for this set of shots stitched in CS6 and adjusted in bridge. After the sunset faded away I selected my location for the startrail setup. It’s still a thinker for me to go through the checklist of all of the settings and configuration on the camera as well as making sure the tripod and gear are secure from shifting as I was near the edge of a very steep bluff, the lens in focus, the horizon straight, etc. I shot with the 14-24 at 14mm, f4, and eighty-five 4 minute exposures seperated by 1 second closures triggered with an mc-36 look-a-like intervalometer. I also used the Fotodiox Wonderpana 145 and UV filter setup just in case there was some dew overnight. That bare assed lens on the 14-24 just scares the hell out of me to leave exposed overnight and on a sand dunes where it could get sandblasted were a wind to come up. 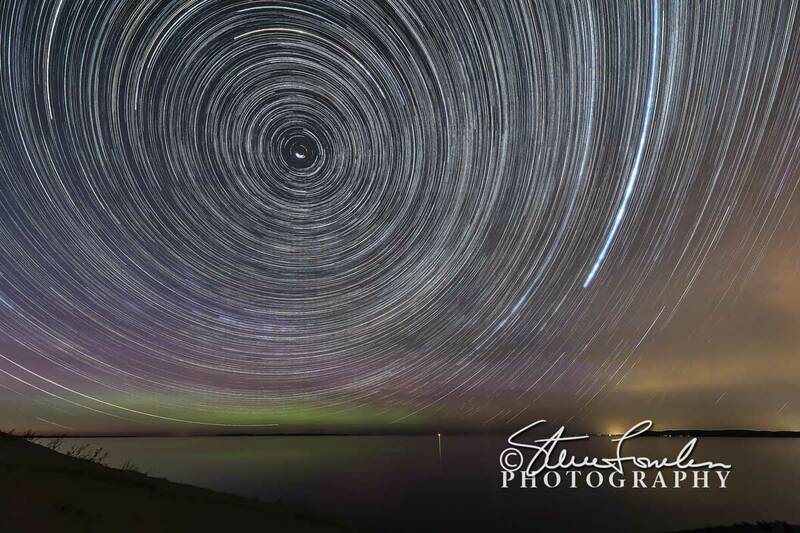 Here’s the results after stacking in Startrails software and adjusting and editing in CS6. Then I went back early in the morning to collect my gear and hopefully get some crescent moonrise shots and then sunrie shots. The moon came up an hour or so before the sunrise so I got a few shots in before it was getting to light on the horizon. I set up for some panoramic work shooting with my 24-70 and some with the 14-24. Here is one of the images stitched in CS6 from 5 shots. Overall a very pleasant night and morning with some acceptable results I think.